SB-880 is made by ANKO for particularly making stuffed foods such as steam bun, steam bread, meat bun, threaded steam bun, beef roll, etc. The advanced design keeps dough texture the same after being rolled up. The SB-880-made final products can compete with hand-made ones. Mold is easy to change. 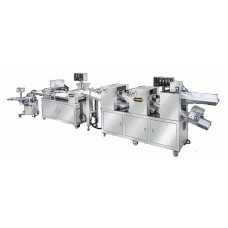 Machine can be equipped with a special stuffing hopper to keep the texture of vegetable in stuffing. The rolling forming function will not destroy the texture of dough, so that the finished food products are the same as hand-made. Machine is easy to assemble, clean and maintain. All parts contact with food are made of food standard stainless steel. Operator needs no experience, production is rapid. The thickness of dough wrapper, quantity of stuffing and size of finished product are adjustable. Brand: Anko Food Machine Co., Ltd.
Automatic Encrusting And Forming MachineAutomatic Encrusting and Forming Machine can produce many ki..
Table Type Automatic Encrusting And Forming MachineTable Type Automatic Encrusting and Forming Machi..
Automatic Encrusting And Forming MachineAutomatic Encrusting And Forming Machine can make either pat..